OAKLAND, Calif. - It's like the dream that won't stop coming. The Red Sox. Except, for Rich Harden, this one isn't a nightmare. But it keeps returning anyway, the good vibes flowing from his right arm to the plate, where if it seems like this season has been an unending parade of Boston batters, that's not all that far from the truth. Though he wasn't quite as dominating as he was in two previous starts against the Sox - he's made three of five starts against Boston this season - Harden controlled their bats, as Tim Wakefield failed to do the same in an 8-3 loss to the Athletics in front of 29,051 at McAfee Coliseum. "He's got as good of stuff as anybody in the league," Sox manager Terry Francona said of Harden, who is 3-0. "He gets into some fastball counts and he doesn't give you a fastball. We've seen him too much. We don't need to face him every other game. I hope he's not going to come back and pitch Sunday." After retiring the first 10 batters, five by strikeout, Harden allowed his first hit, a home run to Dustin Pedroia. Problematic? Not with the A's scoring seven runs over the first three innings off Wakefield, five coming on home runs by Frank Thomas and Mark Ellis. But those weren't the only fireworks. Sox hitting coach Dave Magadan got tossed with J.D. Drew at bat in the sixth inning, with plate umpire Tim Tschida repeating, "He knows better than that," to Francona, who came out to get an explanation. Drew had wanted to get additional pine tar for his bat, but was not allowed to leave the batter's box, part of a new directive to speed up games that went into effect this week. Magadan objected, and soon was thrown out of the game. 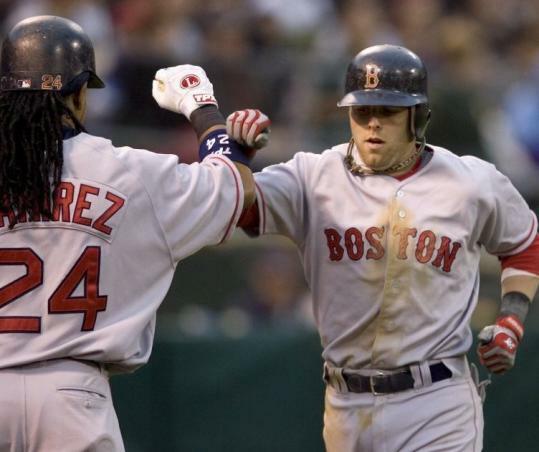 By that time, the Sox were down by five runs, having scored on Pedroia's solo shot, and when Jacoby Ellsbury singled home Drew, who had doubled, in the fifth. That was more than the Sox had gotten off Harden in two previous games this season, but still not enough to make a dent. Oakland lost in Harden's second start against the Sox, then he landed on the disabled list for more than a month with a strained pitching shoulder. Harden entered last night 1-0 with a 0.82 ERA against Boston this season. Harden's two runs allowed on four hits with eight strikeouts in six innings was far better than Wakefield's performance. He had dazzled the Tigers just three starts ago, combining with Mike Timlin on a shutout of what was supposed to be the American League's premier offense. But it didn't last. Wakefield was hit around in his next start, his shortest since 2003, allowing seven runs (six earned) in 2 2/3 innings against Minnesota. And, though it got better against Milwaukee, it got worse last night. In a hurry. Blue Jays castoff Frank Thomas stepped into the batter's box in the first inning with six home runs in 50 career at-bats against Wakefield. He unloaded on the first pitch he saw, and the A's, who already had a run across, led, 3-0. "One pitch to Thomas," said Wakefield, who thought his trouble stemmed from a mechanical problem. "You know the history there." Though he entered hitting just .240 against Wakefield, half of Thomas's 12 hits against the knuckleballer have been homers. While he went 0 for 2 with a walk in their last meeting, he clobbered Wakefield last September, hitting two homers off him in a game, giving him three off Wakefield in 2007. Ellis added a three-run shot to left in Oakland's four-run third inning. It came on a pitch Wakefield called a good one, but one that didn't end up good for the Sox. That gave the A's a 7-0 lead, bringing back memories of Wakefield's last decision, the 9-8 loss to the Twins May 11. The A's added a run in the sixth, bringing Wakefield's total to eight runs allowed on eight hits with four walks and four strikeouts. "When he's really got it going, you can kind of watch my reaction of catching it," said Kevin Cash. "It's a late reaction. He didn't really have that today. Or I didn't have that today. Late movement, more than anything. Kind of unpredictable." Wakefield lasted significantly longer last night than he had against Minnesota, going five-plus innings, but the result was the same - a loss, this one ending a seven-game winning streak for the Sox. "The one thing Wake did for us tonight, he stayed out there and we didn't mess our bullpen up," Francona said. "It wasn't always easy, but he actually put up a couple zeros, 'cause those first couple innings looked a little rough."